In the year AD 440, the Archdeacon of Rome was away in Gaul on a diplomatic mission. While he was there, the Bishop of Rome, St. Sixtus III, passed away. Despite the fact that he wasn’t there, the powers that be in Rome elected the absent Archdeacon as Bishop. They waited patiently for his return. He thanked them for this patience in his accession speech. This archdeacon was Leo I, the Great. I have chosen Pope St. Leo the Great (c. 400-461; see my review of Leo the Great as well) because he is a big part of my life right now, and hopefully this state of affairs will continue for the next three and a half years. I have also chosen him because tomorrow is Christmas, the Feast of the Nativity of Christ, the day we remember the coming of God as a man approximately 2000 years ago, and St. Leo was a theologian of the Incarnation. We have scant knowledge about Leo before his election to the papacy. We know that he was Archdeacon in the 430’s when he commissioned my friend John Cassian (this post gives a list of my major posts about Cassian) to write On the Incarnation of the Lord Against Nestorius (my thochts on that here). He may also have been involved in the Roman See’s actions concerning the Pelagian Controversy. The fact that he commissioned Cassian’s anti-Nestorian work lets us know that in the decade before his rise to the throne of Peter, St. Leo was involved in the Christological controversies sparked in the East by Nestorius in 428. Thus, he was already a student of theology by the time he became pope. 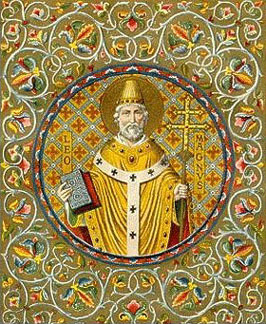 As Bishop of Rome, he changed the previously un-preachy* nature of the Roman episcopacy (taking his cue from our friend St. Ambrose) and began a cycle of preaching that followed the church year, with at least fifteen occasions throughout the year, including the Advent fast, the Nativity, Lent, the Pasch, ultimately Pentecost, the Feast of St. Laurence, the anniversary of his elevation to the Roman See, and other liturgical moments (see the CCEL for translations of a number of these). These sermons are explications of the feasts/fasts and the theological underpinnings of the remembrance at hand. In his Advent and Christmas sermons, St. Leo explicates in wondrous beauty the necessity and nature of the Incarnation — a birth “wondrously singular and singularly wondrous” — for our salvation from sin, death, and the devil. The peroration, or conclusion, of each sermon exhorts the people of Rome to virtuous action; he wants to help them see that being a Christian is the same as being a good Roman. He also takes aim at heretics in his sermons, at times Manichees, who had a presence in Rome, at times Eutyches, at times Nestorius. If you read these sermons, and I encourage you to, you see that St. Leo was a theologian with a pastor’s heart. No, actually, he was a pastor with a theologian’s insight. He demonstrated for the edification of his congregation the theology and action necessary for a healthy Christian life. He also emphasized strongly, contra the now-deceased Bishop of Hippo Regius, the will of God to save all mankind. The question of how it therefore comes about that God happens not to save all mankind is not fully treated in Leo’s corpus. In the letters, we see Leo as a pastor’s pastor, as a pontifical statesman, and as a controversial theologian. He answered letters, for example, from bishops who had congregants from North Africa who weren’t sure if they had been baptised Catholic or schismatic. His answer was that it was being baptised into the threefold Name of the Most Holy Trinity that counted, not the baptiser. He answered questions about Priscillianism for a bishop in Spain. He also tried to impose his will, to a degree, on the bishops of Illyricum. Most strikingly, he tried to impose his will on the Bishops of Gaul. He largely succeeded, diminishing to a degree the see of Arles under Hilary, demonstrating the power of the Bishop of Rome in disputes. He saw the Pope as the universal court of appeal for the Church, a man who could intervene in the affairs of other dioceses beyond his own metropolitan zone in order to maintain and restore order. In the year 444, St. Cyril of Alexandria passed away. St. Cyril had been the theologian of the Incarnation par excellence throughout Leo’s career. He had spearheaded the offensive against Nestorius and had largely engineered the outcome of the First Council of Ephesus. With St. Cyril dead, the mantle of Christologian passed to St. Leo. But was he up to the task? St. Leo’s time came in 449 when he received a letter from an Archimandrite (a senior abbot) named Eutyches, whom a local synod in Constantinople had deemed a heretic. Eutyches was appealing to Leo. Soon Leo also received a letter from Flavian, Bishop of Constantinople, explaining to Leo the circumstances of Eutyches’ trial. Leo responded to Flavian on June 13 with his famous Tome, letter 28. This document is the piece of writing for which St. Leo is most famous for. In this letter, Leo has in his sights both Nestorius as Leo understood him and Eutyches. The former, as far as Leo was concerned, denied Christ’s divinity; the latter, Christ’s humanity. The Tome is a text of balance and duality. Leo sets forth for his reader the balance and duality within Christ of the human and divine natures. He strikes a balance that seeks to avoid the perceived pitfalls of Eutychianism and Nestorianism. God the Word took on flesh, he became fully human without the stain of sin, the lowliness not diminishing the glory. This was necessary for our salvation. Christ was and is a living paradox. That same year, 449, saw the calling of a second general council in Ephesus. This council was engineered by Dioscorus, episcopal successor to St. Cyril in Alexandria, to rehabilitate Eutyches and hold aloft a one-nature Christology, an incipient Monophysite understanding of Christ’s nature. Leo, as was the wont of Rome’s bishop, sent delegates. They were to read aloud the Tome, Leo being convinced that all the Church needed was to read his account of the Incarnation and then all this controversy would end. These delegates were steamrolled by Dioscorus and not allowed to speak. Bishop Flavian received blows that may have led to his death shortly thereafter. He was replaced by a supporter of Dioscorus. Leo called Second Ephesus a Latrocinium, a den of pirates. He wrote letters to Emperor Theodosius II trying to convince him to change his mind and overturn the decisions of the council. He wrote letters to Pulcheria Augusta, the Emperor’s sister, enlisting her help to convince her brother. Theodosius would not be convinced. And then, in 450, he fell off his horse and died. His sister married a nonentity named Marcian and became Empress. In 451, the Council of Chalcedon occurred. This time, Leo’s Tome, along with three letters of St. Cyril, was read out and approved by the Council — albeit, not unanimously, with protests coming from some of the Illyrian, Palestinian, and Egyptian delegates. It seems, as Bernard Green has argued,** that Leo didn’t really know what Nestorianism was until after Chalcedon. Seeing what the objections to the Tome were, he quickly adjusted certain passages and clarified his thinking. Thus, his letter 124 to the monks of Palestine is more representative of the mature thought of St. Leo and would be a better testimony to his thought for the generations to come. Leo spent the years from 451 to 465 maintaining his preaching practice in Rome, keeping order in his Metropolitan, clarifying what the Tome was supposed to say, and keeping Attila the Hun from sacking Rome (this last may not be true, but it colourful nonetheless). He was one of the good popes. He was also one of the first strong steps down the road to the papacy’s claims to universal jurisdiction. We cannot have Innocent III (1160-1216) without Leo I. He produced, ultimately, a clear, lucid theology that dealt with the problems of Eutyches and Nestorius while synthesising the teaching of the great western theologians Augustine, Ambrose, and Hilary of Poitiers with a dash of Cyril of Alexandria. He truly deserves the appellation “the Great”, being one of only two such popes along with Gregory I. *I was going to make up the word un-kerygmatic, but then I figured that if I’m going to neologise, why not at least make a word people will understand? **See The Soteriology of Leo the Great, pp. 227-247.